The Zhangjiang National Innovation Demonstration Zone in Shanghai, an important hub for high-tech companies from China and abroad, is continuing its campaign to attract talents from across the globe. The 531-square-kilometer zone, with 22 industrial parks in all 16 districts of Shanghai, has created the city's largest talent pool. The zone claims that more than 80 percent of Shanghai's high-caliber talents work there. To date, there are some 45,000 foreign experts and overseas returnees working in the zone, according to its officials. This comes as a result of the Zhangjiang National Innovation Demonstration Zone focusing for the past few years on providing better support for its talented people. Foreigner entry and exit service sites have been open in its industrial parks since 2015 so that overseas professionals can visit the nearest office rather than the central Shanghai exit-entry department. In recent years, many policies have been introduced by the Ministry of Public Security to help Shanghai become a center for scientific innovation. These policies granted the Zhangjiang administration the authority to make recommendations and certifications for top overseas professionals working in the zone, who want to apply for permanent residence in China. The zone revealed in March that 63 high-end foreign professionals, including two Nobel Prize winners, had obtained support from the zone when they applied for their Chinese permanent residence permits. The zone has also made available funds to provide more financial support to top professionals. It developed a tailormade lab for Bernard L. Feringa, winner of the 2016 Nobel Prize in chemistry. It also provided 106 million yuan ($15.27 million) to scientist Pan Jianwei and his team to promote the development of the quantum communication industry in the zone. The stem cell research and development center in the zone has obtained a budget of nearly 80 million yuan for professional recruitment. In addition, there are many nongovernmental human resources service platforms across all of the industrial parks in Zhangjiang, funded by privately owned companies and social organizations. The local government is able to use them to optimize services. It offers regular follow-up services to overseas personnel, and online consultations and services, including human resources policy consultation, training, guidance and company registration. The zone has also worked hard to create an environment conducive to innovation and entrepreneurship. It has released a series of preferential policies and financial support for business incubators and makerspaces, allowing startup teams to cooperate with leading universities, research institutions, large companies, science parks and investment institutions. Construction of international communities, schools and a foreign medical insurance settlement system have been running smoothly, the zone's officials said. To help attract overseas companies, Zhangjiang has established 18 overseas business pre-incubation centers in 34 countries and regions around the world, through which it selects high-end personnel for integration into its technological resources, projects and capital. The zone has also gathered a large number of professionals through major scientific projects, including those focusing on stem cell research, quantum communication, medical big data and advanced sensors. 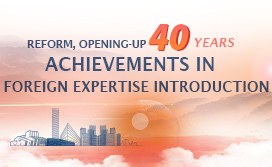 More than 470 experts from home and abroad have participated in these projects. Another key model for cultivating skilled workers is the establishment of training and practice bases in the zone's key enterprises. A total of 14 personnel training facilities have been established by industry-leading companies throughout the zone, which aim to accelerate the development of professionals, technology and management. More than 3,000 people have taken part in the training programs since the beginning of 2017. The demonstration zone also encourages close connections between academia and industry. Through cooperation between universities and enterprises, laboratories have been launched to train professionals and integrate study, research and production. Under such a collaborative mechanism, university professors become research team leaders, and students working in labs earn extra academic credits. There are currently 23 such laboratories with 6,400 postgraduate students in the zone, and it is looking for possible ways to help companies get into contact with more high-caliber experts. Leading companies which support the zone's key projects include State-owned Commercial Aircraft Corporation of China and private companies such as Shanghai Biotecan Pharmaceuticals Co. 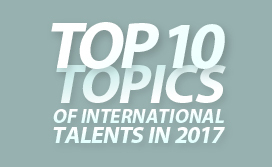 These companies have been invited to participate in some large recruitment events in foreign countries such as Germany in recent years. Zhangjiang is also aiming to receive approval from the Ministry of Public Security to launch more entry-exit policies to better meet professional demand, according to the zone. 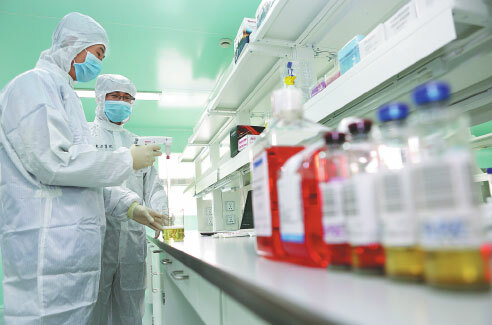 Researchers at a hospital in the Zhangjiang National Innovation Demonstration Zone perform stem cell experiments. A night view of an industrial park in Yangpu district of Shanghai, which is operated by Zhangjiang National Innovation Demonstration Zone.